Standard glass has high emissivity, in that it allows the sun’s energy to pass through easily. Unfortunately, it is equally emissive at allowing heat to pass back through and out to the exterior through the process known as radiation. A low-E, or low-emissivity, coating is a thin transparent metallic layer, only several atoms thick, applied directly to the glazing surface. In a typical double glazed window, it will be applied to a surface between the two panes of glazing. The low-E coating remains transparent to the short-wave solar energy from the sun and allows it to pass through into the interior. However, it reflects the radiant heat emitted by objects in a room back into the room, significantly reducing radiation heat loss. 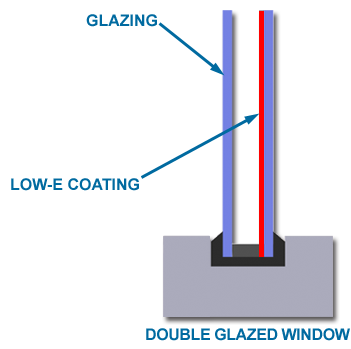 A double glazed window with a low-E coating has about the same insulating value as an uncoated triple glazed unit. The low-E coating alone improves the R-value from R-2 to R-3. There are different types of low-E coatings with different characteristics such as emissivity, light transmittance and solar heat gain co-efficient. Generally speaking in Canada, the coating of choice would be for emissivity to improve the Energy Rating of the window. Care must be taken to ensure the right coating is specified for the right window application.